Adobe Marketing Cloud is a platform that simply imposed itself as one of the leaders in the digital marketing world, managing to integrate a heavy suite of creative capabilities with newly developed marketing functionality. As the result of this integration, we have Adobe Marketing Cloud (AMC), a popular Adobe Web Analytic product helping businesses from various scales and industries develop, but also optimize and measure their campaigns and the results of their marketing performance. Without any false modesty, Adobe Marketing Cloud is a fully integrated one-stop marketing suite, where from you can handle mobile, search, campaign, content, social, and email marketing. Adobe Marketing Cloud appeared on the market in 2012, but has been gaining momentum considerably year by year. More and more prominent companies are entrusting their e-stores to Adobe as a service provider, taking into consideration its reasonable subscriptions, tailored to suit the size and needs of the business, and particularly convenient for loyal Adobe users. For many users, the name Adobe itself is enough to decide to purchase their Marketing suite, but it is still useful to take a look at some of the specific benefits this product has to offer. 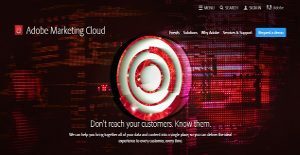 Adobe Marketing Cloud is a popular choice for its robust marketing asset management functionality, which is designed to offer efficient support to distributors of all sizes, across all devices, in any place. It can also facilitate productive team collaboration and creativity as it allows timely exchange of information and documents, including online advertising campaigns and other marketing drives. Needless to say, Adobe Marketing Cloud revolutionized marketing data storage, since it doesn’t simply keep information in a single folder, but it makes it easily accessible to each agent at any time. As a result, the customer experience becomes much better, and there are no unnecessary delays. What is certainly impressive about this program (and what wished farewell to many successful digital marketing platforms at the time) is AMC’s capacity to handle cross-channel marketing, combine and use data appropriately, program and draft strategies on different devices, and still keep focus on the final user while doing it. That’s true: Adobe Marketing Cloud has a variety of features to target and manage your audience, influence prime time, optimize your use of media, and combine mobile, search, campaign, and email marketing in a single platform. Odds are good that you won’t have to use any other marketing tool with AMC on board. Finally, as Adobe products in general, Adobe Marketing Cloud has a flexible pricing scheme. The vendor calculates it on the basis of annual subscriptions, depending entirely on the size and needs of your company. Thereof, you will not be expected to pay for any feature you don’t really need. Since each organization has specific business needs, it is prudent for them to desist from seeking a one-size-fits-all faultless software system. Needless to say, it would be futile to try to find such an app even among popular software applications. The intelligent thing to do would be to catalog the various essential factors that require consideration such as main features, finances, skill levels of employees, company size etc. Then, you should do your research thoroughly. Read some Adobe Marketing Cloud reviews and investigate each of the other apps in your shortlist in detail. Such in-depth research can make certain you reject ill-fitting platforms and zero in on the solution that provides all the features you need for business success. How Much Does Adobe Marketing Cloud Cost? Adobe Marketing Cloud pricing information is available only on quote basis. Please contact the company for further information. We realize that when you make a decision to buy Marketing Software it’s important not only to see how experts evaluate it in their reviews, but also to find out if the real people and companies that buy it are actually satisfied with the product. That’s why we’ve created our behavior-based Customer Satisfaction Algorithm™ that gathers customer reviews, comments and Adobe Marketing Cloud reviews across a wide range of social media sites. The data is then presented in an easy to digest form showing how many people had positive and negative experience with Adobe Marketing Cloud. With that information at hand you should be equipped to make an informed buying decision that you won’t regret. What are Adobe Marketing Cloud pricing details? What integrations are available for Adobe Marketing Cloud? If you need more information about Adobe Marketing Cloud or you simply have a question let us know what you need and we’ll forward your request directly to the vendor.